As a dog owner, some of the most important jobs you have is to keep your pooch well-fed and happy. In their earlier years, this isn't a problem. Energetic puppies and athletic adults will scarf down any food that's put in front of them without giving it a second thought. They're relatively easy to keep healthy with their favorite bag of high-quality dog food. However, things will start to change when your dog reaches their senior years. ​​​​The nutritional requirements of your dog will change the older they get. It's important to adapt their diet to their unique needs. Sticking with the same kibble may result in unwanted weight gain. Not only that, but older dogs can experience a range of health issues that need to be addressed. When your dog starts getting up there in age, you should invest in a dog food formula that's specifically designed for their age and breed. With the right formula, your dog can age gracefully and stay healthy for many more years to come. To help you on your search, here's a list of some of the best dog foods for older dogs. 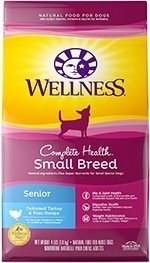 This dry kibble from Wellness contains approximately 9% fewer calories than standard adult formulas. This decrease in calories makes it easier for your dog to control their weight and stay healthy. The entire recipe is designed to accommodate the unique needs of your older dog. It has a healthy balance of beneficial nutrients and high-quality ingredients. Chicken is used as the main source of protein. To help with absorption and energy levels, sweet potatoes are used as a complex carbohydrate. To maintain hip and joint health, there's also plenty of glucosamine and chondroitin. Flaxseed is also included to supply omega fatty acids. They'll help to keep your dog's skin and coat healthy as they age. 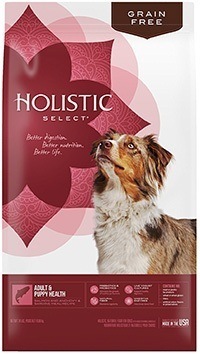 If you're looking for a dog food that won't upset your canine companion's stomach, consider this option from Holistic Select It doesn't contain any harmful grains, corn fillers, or artificial additives. Instead, it contains natural alternatives and beneficial ingredients that will keep your dog healthy despite their lower metabolism. Chicken meal is used as the main protein source. It's accompanied by complex carbs like peas. Beet pulp and flaxseed are also used to supply a boost of fiber. In total, 5.5% of the recipe is made up of fiber. Protein makes up about 28% while fat makes up about 12%. Glucosamine and chondroitin are also added for joint health. 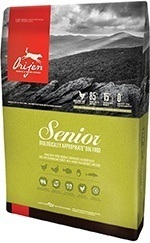 Orijen dog foods are renowned for their high-quality ingredients. The company utilizes a simple formula that contains only the essentials. This particular recipe has limited ingredients that can benefit large aging dogs. The protein comes from sources like chicken, turkey, and wild-caught fish. The feature that makes this food ideal for older dogs is the digestibility. It's designed to be easy on the stomach so that your dog doesn't experience constipation. It contains approximately 400 calories per cup, so you can easily portion out meals to fit your pup's size. The food is freeze-dried for freshness and doesn't contain any harmful additives. 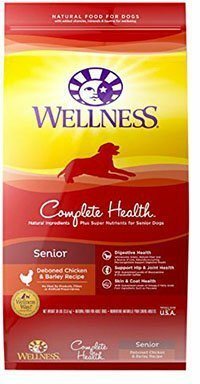 From Wellness is this dog food that's made for small senior dogs. Each piece of tiny kibble is packed with the essential nutrients that support your aging dog's body. The small bite-sized pieces are easy on the teeth and work to keep them clean as your dog chews. The formula utilizes turkey and chicken as protein. Fruits and vegetables like apples, blueberries, and carrots are included to give your dog plenty of vitamins, minerals, and antioxidants. High-quality fiber sources like oats and spinach make it easy to digest. For that extra punch of omega fatty acids, flaxseed and salmon oil is also used. 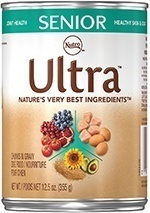 This option from Nutro Ultra contains many unique ingredients that can help your aging pup stay healthy. It has a blend of 12 "superfoods". These include sunflower oil, apples, flaxseed, coconut, pumpkin, and much more. Together, these ingredients give your dog some much-needed vitamins and antioxidants. As for protein, three different ingredients are used so that your pup gets all the amino acids they need. They include chicken, salmon, and lamb. All of the ingredients used are non-GMO. There's also no wheat, soy, corn, or harmful artificial additives. 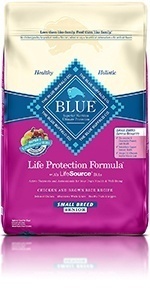 This senior formula from Blue Buffalo contains beneficial "Life Source" bits. These small morsels are mixed in with the kibble and contain plenty of beneficial ingredients. They contain vitamins, antioxidants, and minerals. The kibble itself is also made from high-quality ingredients. Deboned chicken is the main source of protein. Plenty of complex carbs and digestible vegetables are also added. Flaxseed oil adds the boost of omega fatty acids while the glucosamine helps to support their joints. The food is made at lower temperatures. This unique manufacturing process helps to preserve the quality of the nutrients so that your dog can take full advantage of them. If your dog needs a softer food option, this canned food from Nutro Ultra may be a great solution. It contains lamb, chicken, and salmon as the protein source. The same blend of 12 superfoods from the brand's dry kibble formula is used in this wet alternative. Your dog will be able to take advantage of all the beneficial nutrients while enjoying the delicious taste and texture. The food comes in the form of soft chunks and gravy. It has a lower fat content of around 5%. It also contains 80% moisture, so it's soft enough for dogs with dental issues. 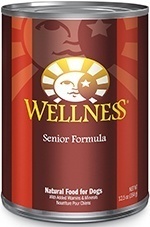 This chunky canned formula from Wellness is designed to help your dog stay hydrated and healthy. It has a healthy balance of nutrients and is made to tackle the problems that many older dogs face. It consists of about 7% protein. Most of this comes from chicken, ocean fish, and chicken liver. Sweet potatoes and ground barley are also included. They are added to help keep your dog's digestive system in check. For skin and coat health, flaxseed is used. Beneficial extras like carrots are also used to supply antioxidants, carotene, and vitamins. Why Make the Switch to a Formula That's Designed for Older Dogs? As your dog gets older, you'll notice a drastic change in their body, personality, and behavior. Even the most active and energetic dog will become less inclined to exercise once they've reached a certain age. Their fur may start to lose color and they may become a bit lazy. These types of changes will affect how your pup processes their standard food. Dogs are considered to be "old" once they've passed a certain age threshold. Dogs have different life expectancies based on their size, breed, and lifestyle. Usually, smaller dogs can live to 15 years or more while larger pups average out at 12 - 15 years. As a good rule of thumb, dogs are "old" once they've reached the halfway point of their life expectancy. 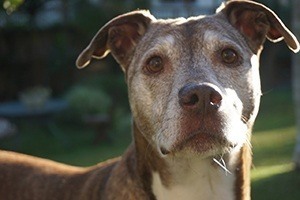 When they've passed three-quarters of their expectancy, they're a senior dog. You should consider making a switch when they've lived half their life. This approach will help you be proactive about their health and avoid common issues. One of the most important things to be wary of is weight gain. It's not uncommon for old dogs to pack on the pounds. This is mostly caused by their decreased metabolism and activity levels. With less exercise and movement, your canine companion will have fewer opportunities to burn off calories. Dogs foods made for seniors typically have fewer calories and less fat. They still contain the necessary nutrients your pooch needs to thrive. Because of their modest calorie count, you can feed your older dog the same amount of food without having to worry about weight gain. Dog foods also contain ingredients that help to battle the effects of aging. Like with humans, older dogs tend to experience joint issues, gastrointestinal problems, skin conditions, and much more. Dog food manufacturers will include beneficial nutrients that can support your dog's body to keep them healthy and free of pain. The size of your dog is a big factor you should consider prior to choosing a dog food. Different size classifications have unique dietary requirements throughout their lives, even in their older years. Some of the major concerns for medium and large breeds is bone health and weight gain. Larger dogs tend to be more susceptible to weight gain due to the high calorie count of adult food. Hip dysplasia and arthritis are also prevalent, so it's important to go with a low-calorie formula that's filled with glucosamine and other beneficial ingredients. Small dogs, on the other hand, need food that's designed to help them maintain their weight and metabolism. Nutritionally-dense kibble is a must-have. They'll need a bit more protein to balance out their changing body. Furthermore, hyperglycemia is a common issue among smaller breeds. It's important to go with an option that contains complex carbs and plenty of fiber to control how nutrients are absorbed. Senior dog foods for smaller breeds are also designed to accommodate smaller mouths and weaker jaws. For healthy puppies or adult dogs, canned food should be avoided. Regardless of the manufacturer or the quality of the ingredients used, wet food is usually inferior to dry kibble in terms of nutritional content and calorie count. To give your dog their daily requirements, you'd need to supply them with a significant amount of food each day. With that being said, sometimes canned food is necessary for older dogs. Senior dogs often experience dental issues like periodontal disease. If they are missing multiple teeth, chewing dry kibble can be painful, causing them to skip meals altogether. In these cases, canned food is a great option. The soft and wholesome ingredients will give your furry friend the fuel they need while making the experience enjoyable. Dog food manufacturers utilize a number of tactics to create a formula that's designed for older dogs. While most are labeled appropriately so that they're easy to find, you can easily determine if an option is a good fit for your older dog by taking a peek at the ingredients list. Glucosamine and chondroitin can do wonders for your dog's overall joint health. When consumed on a regular basis, these supplements can strengthen the connective tissue in the joints. As a result, your dog will experience less discomfort as they move. It's ideal for larger breeds or those that have arthritis. Additional ingredients like fish oil can also do the trick. Fish oil contains beneficial omega fatty acids. Before you choose a formula, it's a good idea to speak with your vet to find a dosage that fits for your dog's weight and breed. Dog treats and standard kibble are notorious for having high levels of sodium. While your dog may love a good salty snack, it's best to avoid them as your dog gets older. Too much sodium will agitate heart disease and can lead to weight gain. To prevent your dog from gaining too much weight, you need to go with an option that contains fewer overall calories. Older dogs are more relaxed and don't spend as much time running around like younger puppies. It's always important to match your dog's caloric intake to their activity level to avoid unnecessary gains. Senior dog foods are less dense. You can continue to feed them the same volume of food to make them feel full without adding any extra bulk. When it comes to fat, go with foods that have a lower content of about 10%. Constipation and gastrointestinal problems are far too common in older dogs. Their digestive tracts are much more sensitive. They may experience diarrhea and stomach pains more often. To combat these problems, look out for high fiber formulas. Ingredients like kale and other leafy greens will help to ensure that the food travels through your dog's system with ease. Fiber also helps to slow down the absorption rate so that they can take advantage of every nutrient the food has to offer. While aging can't be avoided, you can certainly do your part to make the process as pain-free and enjoyable as comfortable. Dog foods made for older dogs will soften the transition and help your dog live their life to the fullest.